Reinforce Branding and Reputation with Flexible Digital Signage Solutions. Digital signage for banks is becoming more common-place due the rise of online and mobile banking. Now, more than ever, financial institutions are dedicated to enhancing the in-person, in-branch experience as well as the user experience online. 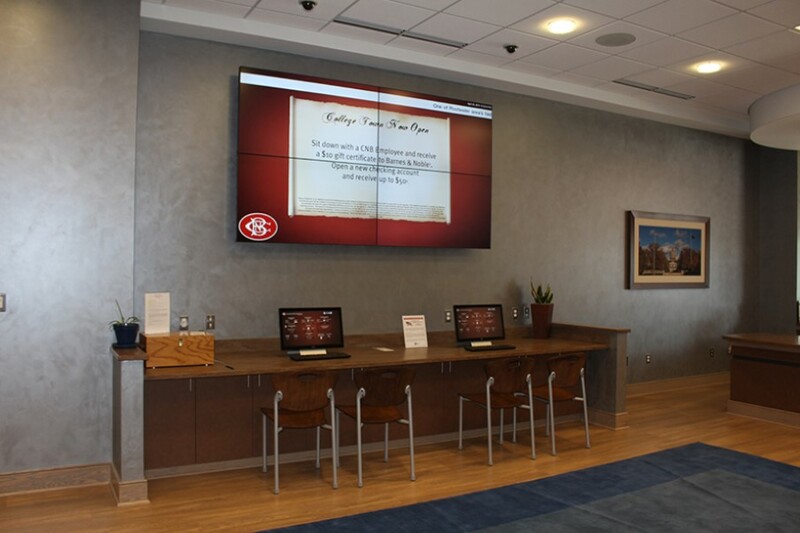 Digital signage can create the tech-savvy and innovative environment your branch is looking for. Flexibility is everything in the digital signage world, making banks and credit unions the perfect candidates for digital signage software. All content is controlled remotely through the cloud. This means headquarters can effectively market at every single branch without ever leaving their desk. 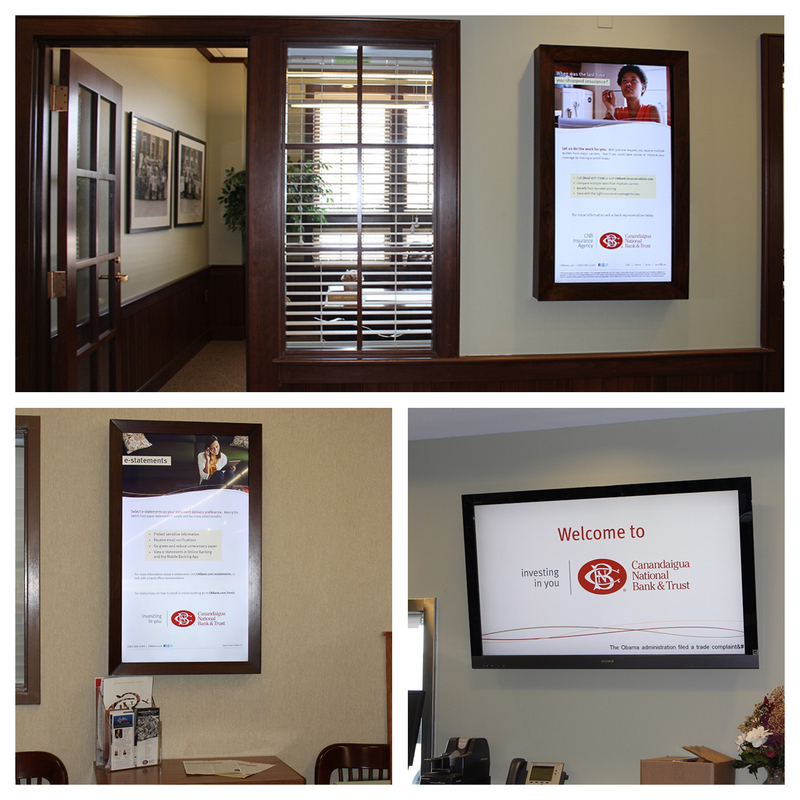 Video walls by Empire Digital Signs are sure to make an impact at your branch. Our content creation team has perfected the skill of creating completely fluid and dynamic content– you’ll forget you’re looking at multiple screens. Ambient light is no issue, as EDS promises to provide you with only the brightest displays on the market. When considering a video wall for your branch, bezel size and configurations are important aspects. Bezel size means the amount of black plastic in between displays. Slim-Bezel video walls like the one pictured above are virtually seamless and are the ultimate in video wall solutions. Configurations deal with 1) how many screens you’d like to have and 2) how you intend to mount them. At EDS we can accommodate any configuration request! Click here for more information on video walls. Click here to request a video wall consultation. Our marketing team helps to successfully increase the frequency of updates without the additional cost of reprinting and courier fees. With digital E-posters, you’ll be able to make updates to your signage as frequently as you require without impacting your yearly budget. Additionally, you’ll be able to hyper-target your messaging based on who enters your branch at specific times of the day. The possibilities are virtually endless with digital signage, so don’t be afraid to get creative and get to marketing! 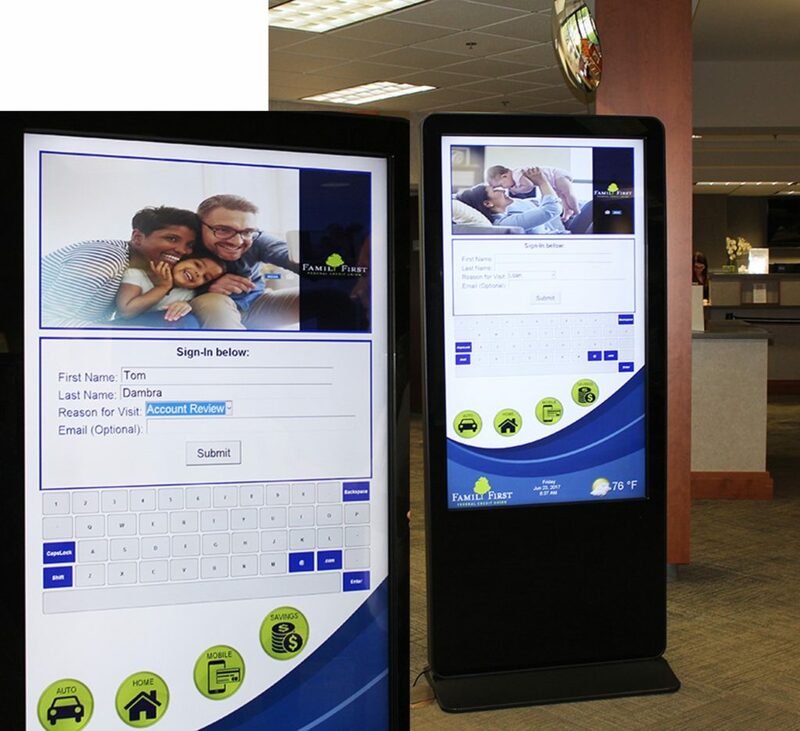 As with all of our solutions, E-Posters come along with all of the benefits of digital signage software such as: scheduling and day-parting, remote updates, live data feeds, zoning and permissions. Click here to request a digital signage consultation. The technological wave has forever changed the way people choose to bank. With online and mobile banking tremendously popular, why not allow your customers to access the same digital platform, but inside your branch? Interactive kiosks can serve almost any purpose from accessing online accounts, viewing transfers, calculating loans, scheduling meetings, paying bills and even opening up a bank account directly from the device. Make things easier on your customer service reps by placing a kiosk at the entrance to assist with the sign in process. See more about this specific system (pictured left) in our blog! Click here to request an interactive kiosk demo. 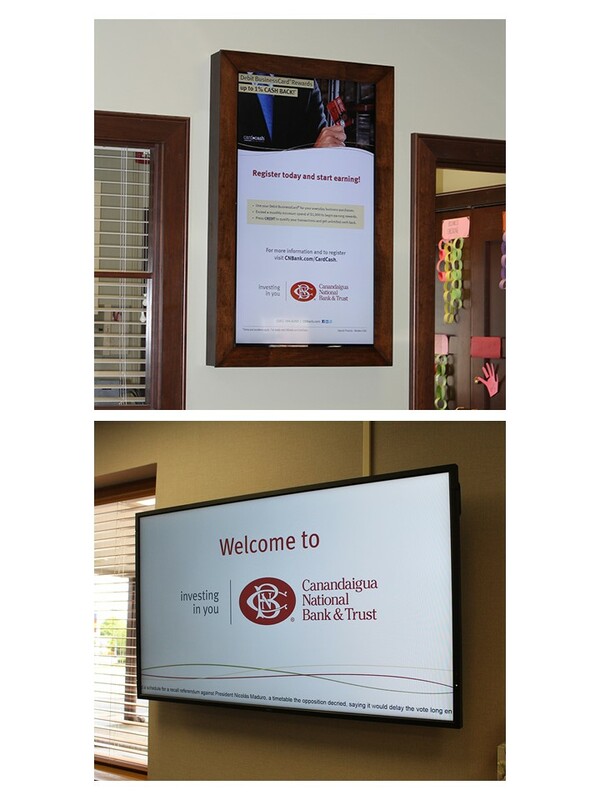 At Empire Digital Signs, we are proud to be Canandaigua National Bank’s exclusive digital signage partner. 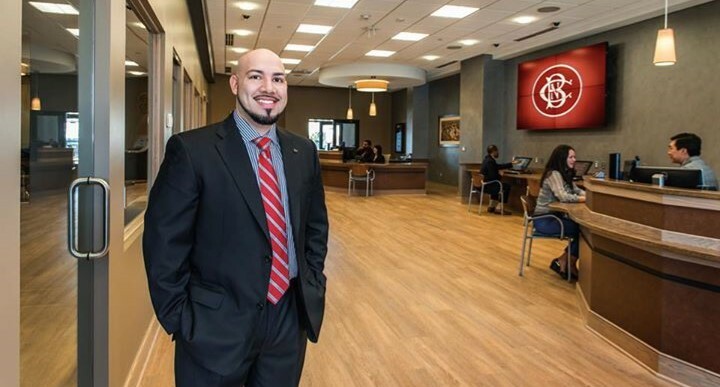 We began by helping the branch create the “Bank of the Future” at their College Town branch in Rochester, NY. We incorporated a 4×4 slim-bezel video wall, an interactive kiosk and E-posters throughout the branch. We then moved on to a digital signage roll-out that would include all of the branches. We converted existing screens to digital signage software and installed brand new 42” E-Posters with custom stained burnished walnut frames. Follow along here as we install at every CNB branch.